to him . . .
Lucinda is thrilled to finally be having her Season. Her mother would be thrilled as well except for the scandal the late duke caused before his death. To avoid gossip, the dowager duchess has decided an arranged match will cover her chaperoning duties. Lucinda, however, is far from pleased with her mother’s choice of the Marquis of Quorndon—especially with her heart set on Lord Elliott. There is only one solution: Lucinda will find a lady for Quorndon. Then she will convince Lord Elliott of their love—and together they will convince her mother. All it will require are good theatrical skills—and a very genuine kiss . . .
Ella has given us an way to open let us learn to that live of the era she writes! I liked this story! This is showing about who is going to marry or who. Lord Rothwell is Lady Lucinda's brother to bring to the Season. Success of Rothwell is their mother. Lucinda has a lot of friends. They try to find who this is or not. You would think of the men have it easy! They worry all about what the women are doing! There are lots of spots I found I had never heard about. I would tell you that this is a Real book being an Adult! I would still you to still recommend read the story! Give the book a chance! Keep on reading! Grab some tissues! You won't regret! Entertaining from beginning to end, this latest story in the Worthingtons saga brings Lady Lucinda and Gerald, Earl Elliott together in an unexpected way! Happy to finally be having her season, Lucinda is not pleased when her mother tries to arrange a marriage for her with a Marquis. Fortunately her brother has asked his friend Gerald to watch out for his sister during her London season. Since he is looking for a match himself, it seems the perfect solution. Not! His affection for her grows as he is around her and it seems she is to marry another! What to do? Well Lucinda has it under control when she decides to find a suitable match for the Marquis instead of her! You see she is falling for Elliott and hopes all will work out for them, that is if her mother does not ruin everything! A delightful tale that will have you smiling as you turn the pages. I'm always happy to see a new Ella Quinn book, I'm a fan (ok, uberfan). 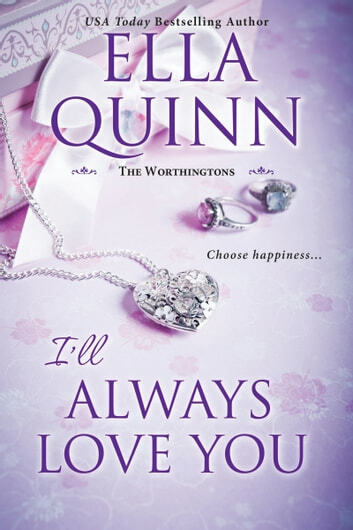 Although I'll Always Love You is part of the Worthington series, it works well as a stand alone tale. We have a story about one of the secondary characters from other Worthington books. He's been in the background long enough. This man was so likeable that you wanted him to have his own happily ever after and Ms. Quinn delivers. I'll Always Love You will be on the shelves of your favorite bookseller on 11-27-2018. Our hero is Gerald, Earl Elliott and he really is a hero. You can always count on Gerald. The Duke of Rothwell (It Started With A Kiss) askes his friend, Earl Elliott, to help watch over his sister during her first season on the marriage mart. Since Gerald is titled, handsome, and single, he's a favorite of ton hostesses. You can bet he'll be at every event and Rothwell's request should be a piece of cake (ha, ha). The Duke invites Gerald to tea so he can meet the lady he's agreed to keep out of trouble. Our Earl has decided being bummed about his bad luck with the ladies won't get him a wife. He's got to get back out there and keep his eyes open for the right woman. Lady Lucinda Hughlot is our heroine. She's the Duke's younger sister and excited about having fun and dancing the night away at loads of balls. Her mother is still embarrassed about a scandal involving her late husband and doesn't want to go out in society. She comes up with an engagement to the son of a friend, conveniently sparing her being her daughter's chaperone. After meeting said Marquis, Lucinda knows they would never suit and she needs to find him another bride. Self-preservation is a powerful motive. Rothwell is not happy, at all, when he finds out what their mother has done. Mom finally agrees to a shortened season before the engagement is announced. Lucinda better get to it, pronto. Tea that afternoon proves to be an eye opening experience. There's a warmth rather than sparks but it's enough to interest our couple in pursuing the feeling. Lucinda is floored to find Gerald is a real looker. He's tall with broad shoulders, mahogany hair, deep blue eyes and the cherry on top...a dimple. I'd be interested too. Gerald is taken aback by how lovely Lucinda is. She has glossy chestnut hair, sea green eyes, a perfect oval face and...she's smart. As they interact during the course of this journey, the attraction grows and Gerald is reluctant to get involved with his friend's sister, but he'd sure like to. Lucinda has no such qualms and sets her cap for the hot Earl. A suitable lady is found for the Marquis and hey, he likes her! We get a reticent man, a determined lady, 2 engagements, one confrontation with the mothers and a Paris honeymoon. The Dowager Duchess of Rothwell does not take the news well, she looks like she sucked on a lemon. She comes around in the end, thank goodness. As this is a romance book there is a happy ending (yea Gerald). We'd be disappointed if there wasn't. Receiving a free book ARC is a true privilege and one I certainly enjoy. Being able to share my opinion is a pleasure. Both are free and without obligation. Happy reading. All things sweet and lovely! Lady Lucinda Hughlot’s mother is determined to see Lucinda married as soon as possible, while Lucinda does not want to marry just anyone; besides, Lucinda wants to enjoy her first Season. It doesn’t take long for Lucinda to deem her mother’s choice, the Marquis of Quorndon, entirely unsuitable. Lucinda’s brother has been tasked to help her along and has enlisted the help of his friend Gerald, Earl Elliott. Gerald has decided that this is the year he will marry, but how will he ever find the right woman? But escorting Lucinda around will give him a chance to look at the eligible ladies. Lucinda knows quickly that Gerald is the one for her, but how will she convince him. But most of all, how will she convince her mother? I’LL ALWAYS LOVE YOU is a delectable morsel with minimal angst, filled with charming characters, and where love reigns. Both Lucinda and Gerald are so very engaging: Lucinda is all effervescence and joy, and knows precisely what to do to convince Gerald without coming off as brash. Poor Gerald, so oblivious and so smitten; he was so cute! And I loved Quorndon in all his foppishness; he was wrong for Lucinda but so very right for another – who was also a most lovely young lady. Ella Quinn’s knowledge of the Regency era and her superb descriptions made me feel as if I were attending my first Season as well! 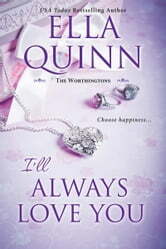 I’LL ALWAYS LOVE YOU is a quick read, everything flows seamlessly; it was a real pleasure to read from beginning to end!